Brick Screen Wall Construction Let the Water Out! "IT TAKES MORE THAN A MASON"
Even though not commonly referred to as such, modern veneer brick applications are Screen Wall Applications. 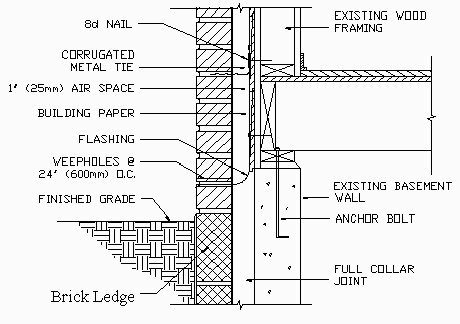 One way to determine if your home is of this type is to look for the "Row Lock" courses incorporated into the structure to connect the interior brick wall to the external brick wall. 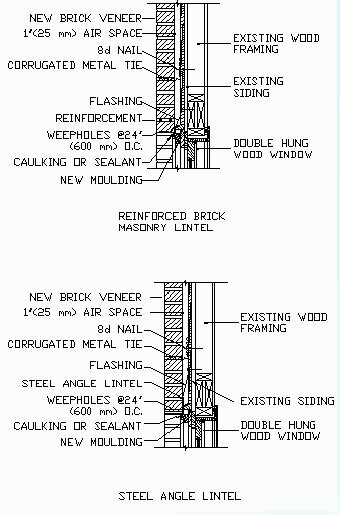 Below, are images of drawing cut-aways of the old rowlock type contruction on authentic 100% brick walls. 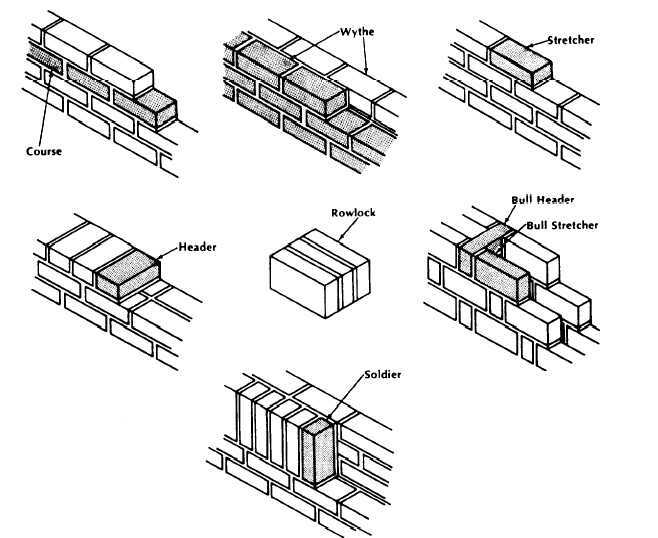 Many times the rowlock courses are evident as systematic rows of brick end rows showing within the construction to tie the interior and exterior walls together. The interior is often plastered or finished for a smooth finish. If your home is of the wood framed variety, a screen wall application is probably whay you have and the main subject of this page. Mass: traditional, solid assemblies that shed most surface water, effectively absorb the remainder, and subsequently release absorbed moisture as a vapor. Examples include solid concrete, masonry, and timber structures. This approach has variable effectiveness in most climates. Barrier: surface designed to completely shed surface water with no moisture penetration. Examples include barrier-type exterior insulation finish systems (EIFS) and stucco or clapboard walls built without a drainage plane (e.g., housewrap, building paper). These are effective in climates with less than 30 inches of precipitation annually. Internal drainage plane: a drainage plane or moisture barrier located between the exterior cladding and the supporting wall that provides redundancy of moisture resistance. Examples include typical stucco and clapboard walls built with a drainage plane. These are effective in climates with an annual precipitation of less than 50 inches. Rain screen: a moisture-management system incorporating cladding, air cavity, drainage plane, and airtight support wall to offer multiple moisture-shedding pathways. Rain screens diminish the forces attempting to drive moisture into the wall. There are two types of rain screens: simple rain screens and pressure-equalized rain screens (PER). 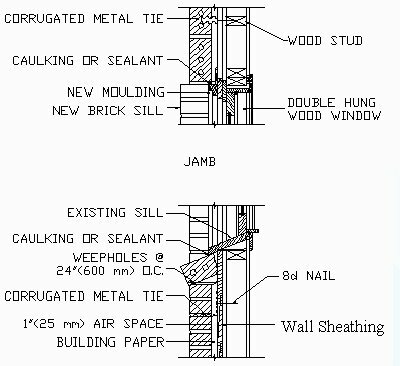 Examples include brick veneer cavity walls, furred-out clapboard walls, and drainable EIFS. Simple rain screens are effective in climates with an annual precipitation of less than 60 inches; PERs are effective in climates with an annual precipitation of 60 inches or more. The latter type listed above is the type of wall to which we are reeferring - Brick Veneer Applications. Unlike other sidings and claddings, like those that employ channels (a mechanically incorrect system), brick can be installed in a way that effectively manages moisture, channeling it out in low concentrations to the exterior of the building to dry naturally by the sun. The main leaking problems with improper installations that can be realized in heavy concentrations along foundation walls, or even worse, inside wall cavities is caused by seepage that is allowed to produce water consentration as gravity pulls accumulated water down the wall. Inacessable leaks are no fun. Many times, the lower framing members of a large exposed wall rot out and need to be replaced. The cause of many of these problems stem from the original brick mason that had not thought out the reality that his main focus on sidewall application should be that of moisture and water management. Flashing the openings and proper underlayment are of extreme importance, but so is maintaining a clear one inch air space between the brick and the building wall. It is quite common for the mud to fall into the wall and accumulate and pile up to form blockages and bridges for moisture to accumulate and enter the wood framed wall. Steel Lintels can also rust and cause a host of major problems. 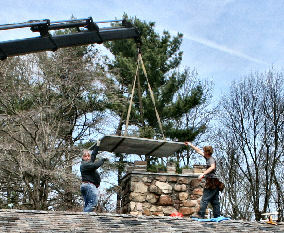 Often, underlayment consists of sub-quality felts and housewraps, when more formiddable underlayments are attainable. After the brick is installed, no one sees the underlayment and the subsequent damage is often realized decades later. The focus of providing a "breathable" exterior often leads to the use of house wraps. These products are often lapped inappropriately (back lapped) to "buck" water. Sealing the exterior brick is a taboo subject among historians, but often a final resort, and only option to a constant leaking problem. This is only because the original details fail to manage water and direct it back out to the outside of the building. In sealing a masonry wall, the wall must be dry and the hot summer is the only time to consider this application. Remember, this is a last resort before tearing down a wall. The moisture that seeps into a wall cavity usually enters at the mortar or putty joints. These joints must be maintained properly. Vines growing on a wall can be devastating to a wall. The strength of the grip of vine growth on a wall is hard to imagine without having to had to remove them. Read about vine growth and the damage it causes. Deal, NJ: Vines and Water Damage to a mansion on the New Jersey Shore.